Is it me or does it seem like as the years go on in your marriage or life that finding a good, different, fun or funny gift for your spouse gets harder and harder? I am always looking to Wow my husband or at least give him something he would not normally buy himself for the Holidays. I found a place called Uncommon Goods that sells stuff just like that, unique and unusual gift ideas. I browsed the For Him section and found all sorts of cool stuff including the Top 10 Gifts for Men. Everything is listed by category like, gifts for geeks, gifts for sports fans, gifts for handymen and much more. Not only do they have great items for the man in your life but they have Holiday Gift ideas for Her, for the Office, Dining and Entertaining, for Kids, Jewelry and Accessories and more. 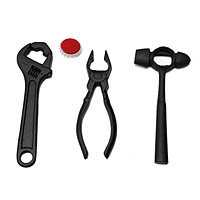 While checking out all of the categories I came across these cool Cast Iron Tool Bottle Openers in the Handymen section. My husband loves the bottle root beer and a few beers on Football Night Sunday, so I thought this little device would be great for him. It is nice and heavy, made of cast iron and very durable. Not to mention super cute!! Then in the Sports Fans category I found these super cool Golfers BBQ Set. 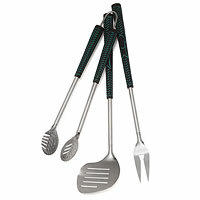 It is a 3 piece stainless steel set with soft insulated handles that look just like golf grips! Golfing is one of his favorite things to do so I knew this set would be a hit. He chuckled at how unique the set was (just what I was looking for in a gift) and could not wait to break them in on the BBQ. Looking for something fun and unique for your teen that just seems impossible to shop for? 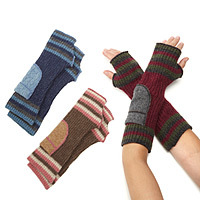 How about these Recycled Knit Arm Warmers? 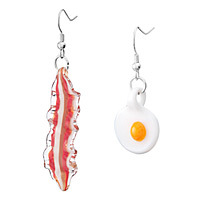 Or if you are feeling really daring how about these Glass Bacon and Egg Earings. Ahhhh love it! Ok one more, how about your Mother-in-Law who has everything? 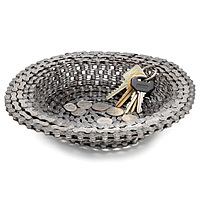 I bet you she does not have a Bike Chain Bowl! For the kitchen crafty person there is a Cheese Making Kit that could be a lot of fun. Or the Spongester for a great Hostess Gift. I am telling you I could go on and on about the fun and unique Holiday Gift ideas Uncommon Goods has, check them out for yourself! Win a $50 Gift Certificate to Uncommon Goods. What item would you like to have from Uncommon Goods? *Limited to US residents; 18 years old and above. Giveaway starts December 9, 2011 and ends on December 17, 2011 at midnight PST. Winner will be emailed and has 48 hours to respond before another winner is selected. I was not paid for this giveaway or post. The opinions on this item are 100% mine and may vary from others. The sponsor is responsible for providing the prize. I'd like to have the Zoku quick pop maker. Thanks! I like UncommonGoods on FB as Sam Whitney L.
I follow FFT on twitter as @Ramblesahm. Oh I would love to get the playon crayons! Carter is just learning to color. I would like to buy the glass egg and bacon earrings, they are just too unique! i love thier wooden tie!! I like the NESTING PREP BOWLS! I need those arm warmers. I would love to get beer making kit!! I'd love to have the recycled knit arm warmers. I like Uncommon Goods on Facebook (FB name: Maddie Brubaker). I follow Uncommon Goods on Twitter (@shala_darkstone). I like Uncommon Goods on FB. Follow you on GFC as Michelle S.